Xscapers is a support network for the Escapees RV club that is geared toward working age RVers. Because of this, many Xscapers have found unique ways to incorporate a comfortable workspace into their RV. This allows them to take care of business, travel, and explore in comfort. 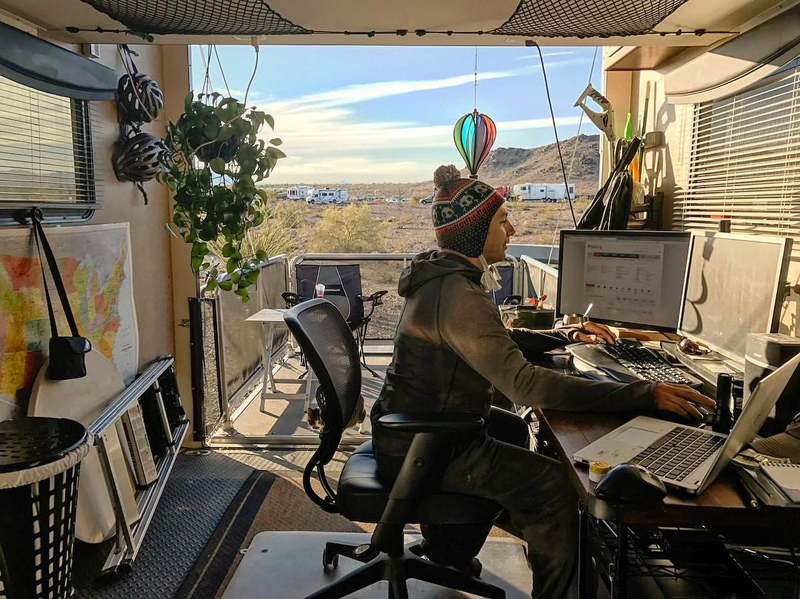 If you’ve ever longed for an office with a view, take a look at these RV workspaces. 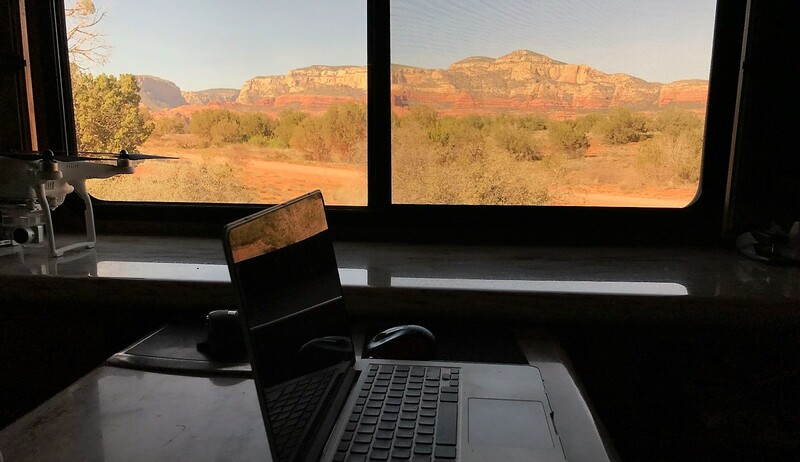 Maybe you’ll find inspiration to take your life on the road and have an ever changing view from your RV office. David works around 15 hours per week as a marketing strategist for Escapees RV Club. He most appreciates having the flexibility to have a standing RV desk when needed. His desk can convert from seated to standing with a few quick adjustments. David and his wife, Cheryl, removed previous furniture, which included two recliners, from the end of their living room area. They then painted that space a bright, welcoming blue, adding some personality to the small space. Then, David found a convertible standing desk, updated small pieces of décor and purchased a comfortable chair. The entire cost to renovate their RV office was roughly $400-$450, which was offset by selling the furniture they removed. 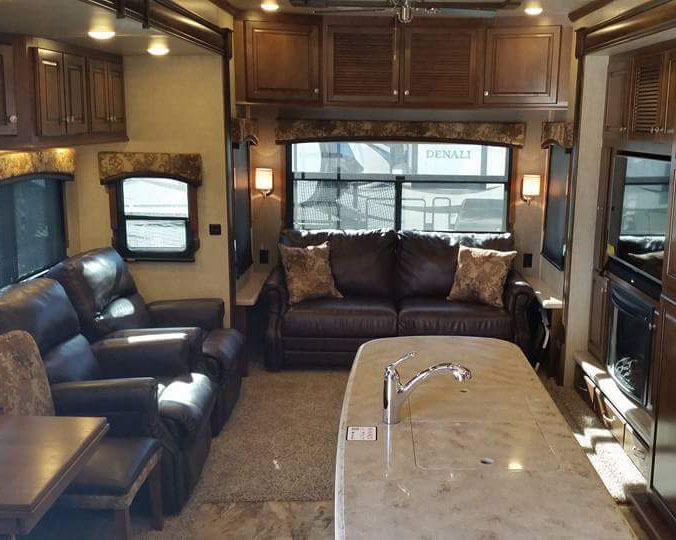 Their RV before the couch was removed for David's desk. Their space is a great option for those who don’t want to make significant changes that affect resale options. Though they did remove furniture, it isn’t difficult to replace that for the next buyer, or for the next owner to create their own plans for this space. Also, because it is part of their main living area, it is important for them to keep the area neat and integrated into the rest of the living room. Denny works full-time, 40 hours per week, as client executive. He must maintain a rigid schedule, adhering to the Eastern time zone regardless of where his travels take him. He and his wife, Veronica, have a unique setup. They own a toy hauler motorhome, with a convertible bunk/patio space. Denny’s RV office is in this area of the rig. When it’s a gorgeous day, he lowers the rear door and creates a patio space that allows fresh air and the sounds of nature to fill his office. When asked how much this setup cost, Denny was unable to pinpoint an amount. The space is part of the floor plan of the rig, so they didn’t need to do much to arrange his needed equipment and furniture. Also, much of what he uses as a RV desk was re-purposed from other furniture. For example, he has two short metro racks as ‘legs’ for his desk, which provide storage space for his CPU, router, and other equipment. A slab lays across these two racks to create his work surface, which accommodates two monitors, a keyboard, mouse, multi-line phone, cell phone stand, and other tools. With the back deck down Denny gets an office with a view! Veronica works 40 hours per week as a graphic designer for a national bank. She, too, must retain a fixed schedule that adheres to Eastern time zone. This often results in early nights and even earlier mornings when she and her husband, Denny, are traveling on the West coast. She most appreciates the view from her RV workspace. Her workspace is set up in the front of their rig, at the opposite end from Denny. While she gets to enjoy the view from the front windows, she also has more quiet time. The insulated walls of the rig dampen exterior noises, and if she needs to remove all distractions, she can also pull down the window shades to create a quiet place conducive to focused work. Her setup is unique compared to her coworkers, but a common approach for many RVers. She uses the passenger captain’s seat as her office chair, facing the front of the rig throughout her work day. Her primary computer is mounted to the cabinet above, and flips down when needed, and folds up to stow away when not. The dashboard serves as a desktop where her keyboard lives, in addition to whatever other tools she needs handy. To her left is a console table that serves as a secondary workspace during the day. Because much of her equipment is provided by her employer, she doesn’t have a rough figure on the cost to set up her workspace. However, tech aside, much of what she uses is either standard in many rigs, or is multi-purpose in that it serves other purposes on non-work days. Something worth noting in both Denny’s and Veronica’s workspaces is the level of personalization. Though these spaces must serve a functional purpose, each have included travel mementos and other small touches that make their desks more comfortable and enjoyable, much as you would a standard office. Also, though both have rigorous work schedules, Denny has more freedom to move throughout the rig during the workday during his breaks. Because of this, he takes care of their pets, makes meals/snacks, and assists with other small tasks during the day, allowing Veronica to stay focused. This arrangement has worked well for them in their five years of traveling while working remotely. Bernal is a software developer, working 40 hours per week. He has been working remotely and traveling for approximately one year. One of his favorite components of his workspace is his widescreen monitor. Instead of having a multiple-monitor setup, his single monitor can display 2-3 different screens simultaneously, reducing the number of cords and other clutter on his desktop. His wife created a harness of sorts for it, so that on travel days it can be secured to the wall of the rig to prevent it from falling or sliding around. After considering different options, Bernal and his wife Kathy decided to remove the built-in seating and turn that area into a workspace for each of them. Because he is the primary source of income, his needs were prioritized as they laid out the space. His monitor sits on what used to be the shelf behind their sofa, while all of the cables, internet equipment and such are stored in the cabinet above his workspace. Bernal has a custom keyboard tray built into the shelf so it sits at the perfect height for him. There are several other custom components that he and Kathy have created All of the cables, boxes, etc associated are stored in the overhead cabinet at his workspace. Altogether, it cost an estimated $300 to complete these changes. They have used this setup for approximately a year. Though this setup works great for his 9-5, Bernal wishes he had a little more privacy at times. Not from Kathy, but from distractions in general. Currently, when he has a conference call or other important phone call, Kathy puts on noise cancelling headphones and finds things to do elsewhere in the rig to occupy herself. It can also be problematic to do daily maintenance tasks (washing dishes, prepping meals, entertaining the dog, etc) while Bernal is working due to the potential for noise disturbing him. Katherine works forty to fifty hours each week as a mortgage policy writer. She has worked remotely for four years, but has been traveling while working for the past year. Eric works twenty hours per week as a radiation tech. While he does work remotely, much of his work is conducted on-site at varying locations. Katherine and her husband share a workspace, so flexibility is very important to them both. She really enjoys being able to ‘change the scenery’ when needed. For example, she spends all of her work time at her desk, whereas Eric works on-site fairly often. So, if she’s bored of looking at one side of the rig, she can easily rearrange her equipment and create a different view for herself without excluding Eric’s needs for space. 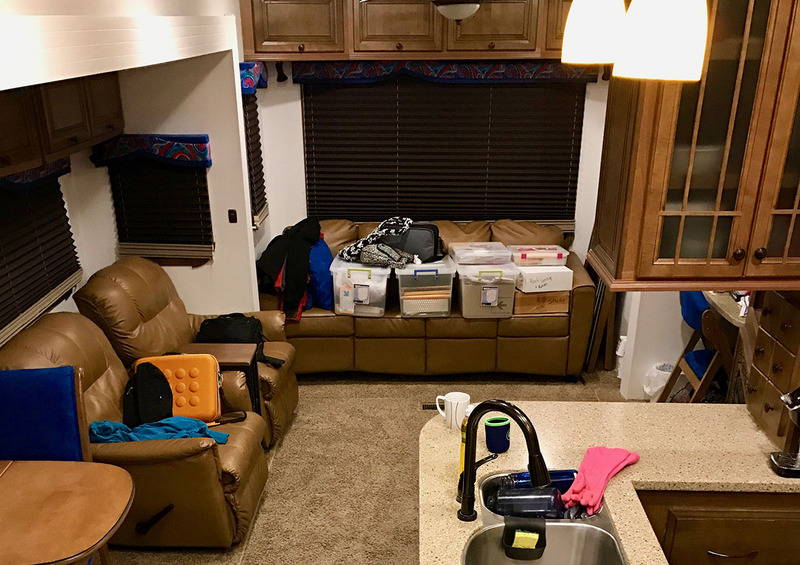 Their workspace is very small, as Eric and Katherine currently share the dinette in their Class B motorhome, but it has exactly what they need. It’s also very comfortable- Katherine sits in the driver’s seat, turned to face the dinette table. This allows her to sit back and relax at times, as well as immerse herself in her work. She uses an ultrawide monitor that is mounted to an articulating arm, so she can move and rotate her monitor to her needs, as well as maintain comfortable posture, making her long hours easier to endure. Instead of a CPU, she has this monitor wired into her laptop, allowing her to get maximum use of her work surface. All of the windows are covered in Reflectix, both for added insulation and isolation and privacy during work hours. A skylight above her seat allows natural light in, which helps conserve electricity as well as gives her workspace a nice ambiance. Eric’s setup consists of an iPad and a laptop, both of which are used daily. Because they are often on-site with him, too, none of his equipment is affixed to their workspace. Melinda is a Business Intelligence Developer, working forty hours per week, fully remote. She most appreciates that her workspace is secure, and doesn’t need to be put away every time they move. The desk is bolted to the floor, and her chair slides snugly under it. All parts are located on the same slide, so no need to shift things around when closing the slide for travel! They created the space by removing their dinette and installing a custom-built desk. This setup is particularly nifty because the desk was built to accommodate a dog crate in addition to providing a workspace. It is made of plywood and stained blue to match the custom dining room table. “It cost us about $50 to make the desk, only because an amazingly talented master cabinet maker gifted us the construction of it.” Her equipment consists of dual monitors, an ergonomic keyboard and mouse, all of which fit comfortably on the desktop. She enjoys ample natural lighting thanks to the windows surrounding her space, including an entertaining view of her hummingbird feeder. Lisa and Dan work approximately 25 hours per week, earning income from blogging, writing, influencing, and serving as brand ambassadors. They love all of their workspace. “When we work, we get to look out the back window at our new view which inspires creativity and free thought,” says Lisa. They have also incorporated pet beds into their workspace, giving their cats a place to rest and keep them company while working. Lisa and Dan recognized the need for a workspace that would accommodate them collaborating as well as working separately. They made plans to carve out space in their 41’ 5th wheel that included removing furniture and replacing it with more functional pieces. Like many RVs, their living room area consisted of a sleeper sofa, recliners, and an entertainment center. Upon deciding to remove the sofa, they began looking for the perfect desk for that space. They selected a table from Ikea that would allow them to use both as a workspace and as a place to entertain guests. Though it doesn’t have the storage they would have gotten with a traditional desk, they have appreciated its versatility. To freshen up the space, they took on a total-rig update with new paint, new flooring, new décor, and more, which included their new workspace. Their now flexible workspace cost them around $600, including the desk, two chairs, and desk accessories. They are the President and Vice President of Escapees RV Club. They also serve on the Board of Directors for the organization, directly manage several projects, and play a role in the daily operations. They both work 40 hours a week or more. Their favorite part about their setup is the ability to place their large monitors for their desktop computers on the ledge that runs along the side of our RV. In previous setups, they always had to have small laptops to save counter space which were not very efficient for the way they work. While they oversee and manage separate projects, the majority of their time is spent working together. Being able to have a setup that puts them side-by-side is advantageous for when they need to talk through something or hop on a meeting together. Overall, the setup is quick and easy. The ledge also keeps space open for other things like the dining table, so they have almost nothing that needs to be moved other than a keyboard and mouse. A little luck and a little trial and error! This is their third RV and they have always struggled to find a comfortable working space. When they first transitioned to part-timing in the Monaco Knight, they were fearful about the layout not working because the only options were centered around the dining area. They always aim to not modify their RV’s for resale value, so they tend to work within the limitations of the RV. This also means they did not have to put any money into the workspace. The area where Travis works was already semi-set up for working with a pullout drawer to put a keyboard or laptop in and a pullout for a printer underneath. That kept his keyboard/cords and other items off of the countertop space and then he placed his monitor on the ledge. There is also plenty of cabinet space underneath the ledge for him to place his desktop tower. Melanie uses a desktop iMac computer, which gets placed on the ledge and the keyboard and mouse are small and used on the table. Travis does not have to move anything during travel days—his monitor rides on the ledge and Melanie just unplugs her iMac and places it on the bed while traveling. They are RV educators as well as part time content strategy directors for Escapees RV Club. They live full-time in their RV and work 40+ hours a week. Their favorite part about their setup is that they didn’t have to make many modifications to their RV to make it work. This is their second RV and they searched hard for an RV that provides a good workspace with nice light and good airflow so they are comfortable working even when camping off grid. After finding a floorplan that they liked and would work well as a mobile office they made some minor changes to make the space work better for them. They removed the fronts of the drawers under the counter tops and put hinges on them so that they can fold down out of the way. Then they made wood tops for the drawers to serve as keyboard trays. Their computers are kept in a cabinet down below. They added cooling fans to the side of the cabinet to make sure the computers stay cool, and they drilled hoes in the counter top to allow them to keep most of the wires out of site. When they travel the only thing they have to do is unplug the monitors and put them down on the floor. In the future they will be changing out the counter tops, blinds and decor to make the interior look a little less “RV”. Jessica is a UX designers for non-profit organization. She works 40 hours a week. The flexibility of standing or sitting, and the fact that it all packs away nicely when she’s not working. Sitting on the settee was terrible for her back, so she removed half of the settee and swapped it with a supportive chair. Even in a nice chair, sitting all day wasn’t ideal, so she asked her uncle to help her concoct a non-destructive way to hang my monitor at a standing height. This gives her multiple work options in her RV. 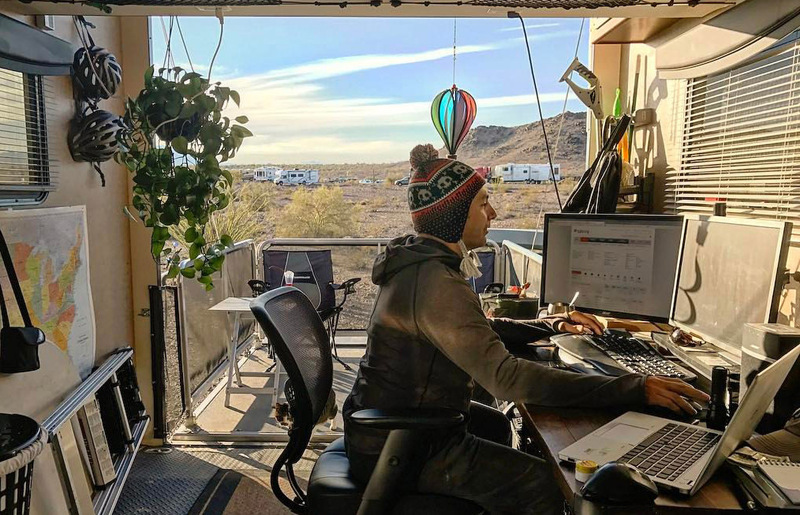 Do you have an RV workspace that you would like to share? Send us some pics and information about how your work space works for you.